In this column, it has been my sworn duty to share Tokyo’s bounty of kid-friendly activities with interested parents like you. I hope earlier columns indicate that I take this responsibility seriously, striving to showcase only places that add much-needed components of fun, culture and education to the lives of our children. Which is why this month’s column may seem out of place: I’m going to urge you to visit Hello Kitty. Seriously. Not a fan? Neither am I, so hear me out. If you actually are a disciple of Miss Kitty, then you may not like what I say below, so just stop reading now and head to the ticket booth. Go on now. Bye-bye! Are they gone? OK, let’s get down to business. 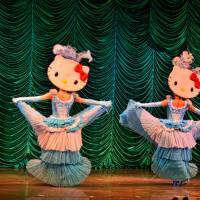 So your child wants to see Hello Kitty “in-person,” but the character’s vapid, saccharine image makes you nauseous, right? Perhaps you just haven’t had a big enough dose. If you’re going to allow any of this treacle into your system, then I suggest you go all-out and head straight to the source: Sanrio Puroland, home of Hello Kitty and all other Sanrio characters. 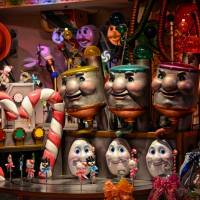 What comes across as tacky, soulless commercialism in small amounts transmogrifies here into an ornate, sugar-fueled spectacle of near-baroque proportions. Let me put it another way: You know that expression “so bad it’s good?” That’s Sanrio Puroland for me. It is so over-the-top that it has become a place that I — against all of my instincts — recommend you see for yourself. I could not have dreamed up a more ridiculous and awesome shrine to the goddess of cute if I’d taken peyote and gazed at her blank, whiskered face through a kaleidoscope. As you have probably guessed, I am not a proponent of large, corporate-owned character-goods makers (I’m looking at you, Mickey), but not so opposed that I refuse my children exposure to them. Like many other parents, I’ve put on a brave face, trudged out to the Magic Kingdom and lined up for meet-and-greets with Snow White and her grotesquely out-of-proportion dwarves. And I’d do it again, too, if my kids really, really wanted to, but I have willingly — enthusiastically, even — returned to Sanrio Puroland. Twice. You should too, especially if the weather is poor, as the Kitty’s lair is underground, climate-controlled and seemingly unaware of the outside world. 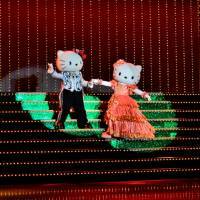 Unlike most amusement parks, entertainment at Sanrio Puroland is based mainly on live shows. There is only one ride: a boat route that bears a striking similarity to Disney’s “It’s a Small World” attraction. 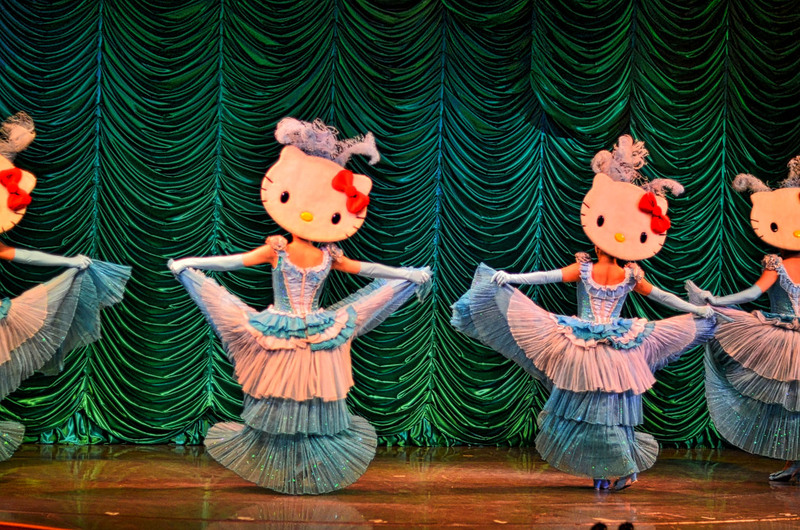 Instead, there are four main theaters where costumed Sanrio creations act out their adventures via squeaky, synth-filled musical numbers. I’ve seen legs and a mouth materialize on a massive slice of cake in order to attack its foes. I’ve seen witches in miniskirts handcuff a bunny rabbit to a massive strawberry. And these sightings aren’t even from the parade, the venue’s main attraction (find your spot on the floor early, or park yourself on the stairs near the entrance). Here a procession of dancers in resplendent costumes frolic around a gargantuan treehouse, pulling unicorn–shaped kites and sparkling floats resembling seashells and turtles. Acrobats flip through the air, and a man with feathers growing out of his head rises above the crowd to sing about friendship. 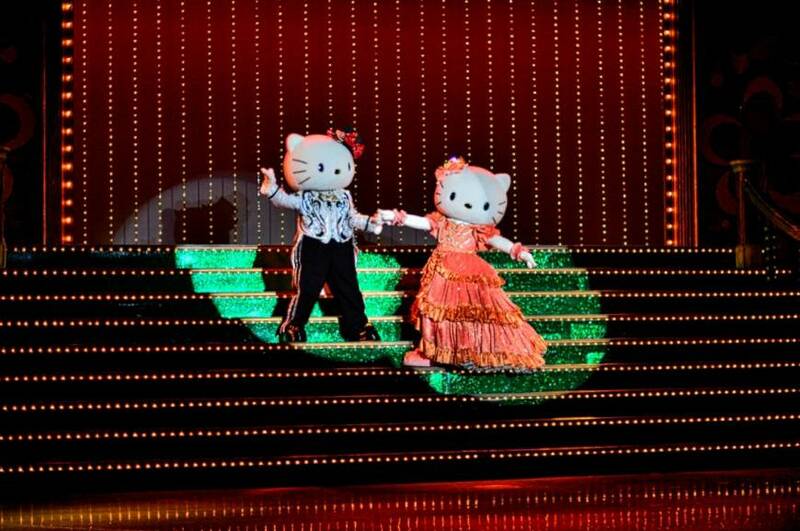 The grand finale is — you guessed it — Hello Kitty herself, lowered from the ceiling in a spectacle of wires, lasers and glitter. The stagecraft, like everything else in Kitty’s cave, is meticulously detailed, though possibly flouting the laws of copyright and good taste. While not always explicit, a quick glance around could give the impression that Kitty is old friends with Tinkerbell, the Easter Bunny, the Wizard of Oz and many other recognized children’s characters. 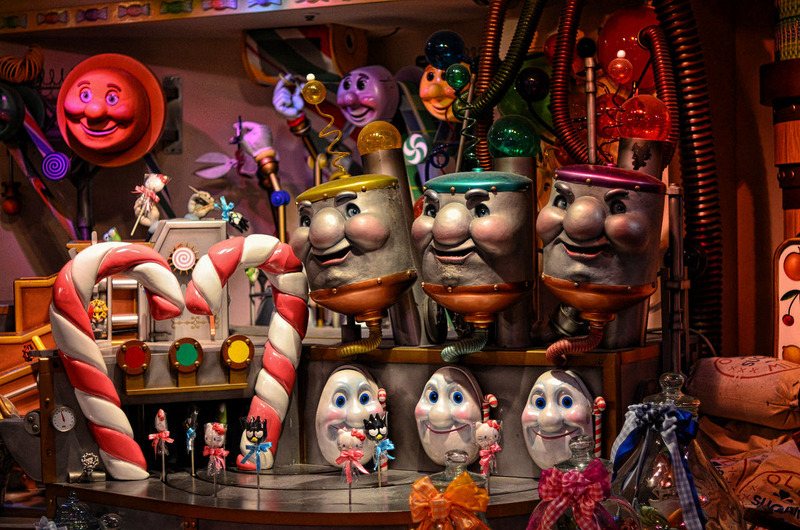 There they are — or a simulacrum of them — staring back at you from displays, costumed dancers and wall murals, and you begin to wonder if someone spiked your milkshake. This place is borderline psychedelic, and I’ve had moments that almost felt like a flashback from my college days. How else would you explain the urinals shaped like trees with disapproving scowls on their faces? 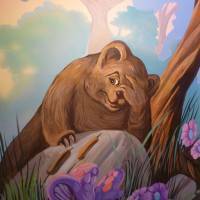 Or the restroom walls decorated with hand-painted bears, all in positions alluding to defecation (I thought they only did it in the woods)? 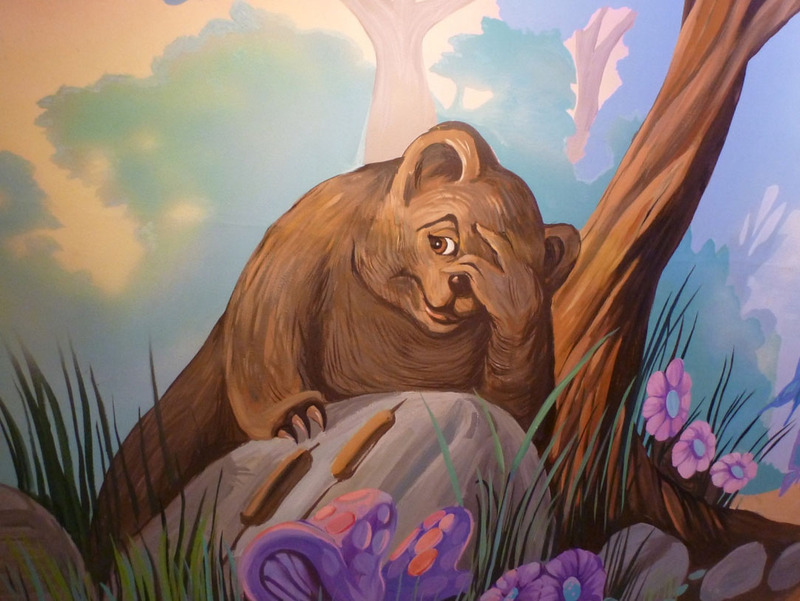 Or perhaps the adjacent real outhouse where an animatronic bear sits on a toilet humming “Home on the Range”? And that’s just from the men’s room. At this point you might think I’m writing some kind of hit piece on Sanrio. I’m not. I have honestly enjoyed the hell out myself here. Perhaps not the way they intended me to, but still. The only thing I can’t reliably recommend is the venue’s food court, since I’ve always avoided it. The nearby shopping centers are full of restaurants, and the idea of eating overpriced cakes in the shape of Sanrio’s main matriarch might just have killed my buzz. Above all, my daughter and her friends always have a blast in their own way, as well. If you find the concept of adorable absurdity intriguing, you might want to give it a try.